Explore the world of partner yoga in a whole new way... with BLINDFOLDS! Partners take a sensory journey with each other through touch, laughter, balance, love songs, massage, and yup.. FOOD! Less about the accomplishment of the poses, and more about the connection and shared experience of attempting them…this romantic date night is playful, fun, and open to all skill levels. This workshop is commonly held on a weekend evening and includes champagne, whipped cream, and a tasting plate for partners to feed each other. All dietary needs can be accommodated. Duration: 2 hours – can be condensed or extended upon request. Equipment: 2 yoga mats. Blindfolds (students are asked to bring their own). Optional props include blankets, bolsters, and blocks. Hosting facility must provide all equipment. Shared touch in the form of yoga is similar to a massage. The spirit is revitalized with a gentle touch, the even flow of breath, and the focused attention on one another. Partners of all types work together in maximizing their yoga practice. Students are asked to come with a boyfriend/girlfriend, family member, best friend or roommate. They will learn how to be there for each other, communicating and supporting one another through yoga poses. Chosen poses are non-romantic and presented in a respectful way. Students are meant to feel comfortable and confident in working together. This partner workshop is playful, peaceful, and open to all skill levels. This workshop is commonly followed by champagne, red wine, and lite bites. Equipment: 2 yoga mats. Optional props include blankets and blocks. Hosting facility must provide all equipment. Great for office employees, students, beginners to intermediate, and those with limited mobility. Sitting for long periods of time has numerous negative effects on the body. Chair Yoga helps to reverse and prevent these effects and can be done in any environment where you are sitting. Perfect for all levels and body types, chair yoga improves circulation, digestion, metabolism, concentration, stretches the muscles, opens the joints and creates a new sense of energy and calm. 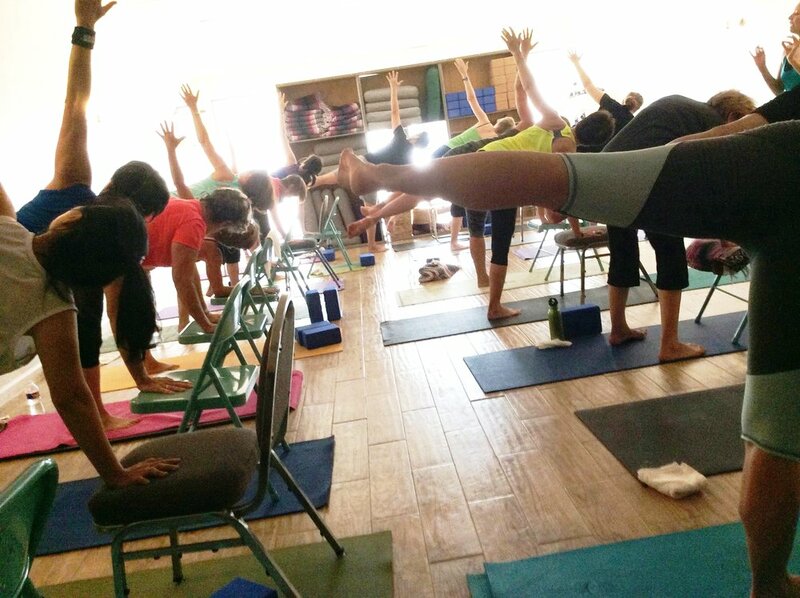 Chair Yoga can be done at the office, at home, on a plane, in a car... anywhere you are sitting! Equipment: 1 chair (non-rolling preferred). Optional props include blankets, straps, and blocks. Hosting facility must provide all equipment. Yoga is a great way to help regulate sleep patterns. Students will learn the most common things we do that disrupt sleep, and how to correct them. Students will learn a moon salutation series, restorative poses that focus on calming the mind and body, and will enjoy at least 2 different guided meditations. This workshop is commonly held in the evening, followed by banana chamomile tea and sleep promoting lite bites. Equipment: 1 yoga mat, 2 yoga blocks, 1-3 yoga blankets (beach towels also work), 1 yoga strap. Optional props include eye pillows, bolsters, and a bare wall. Hosting facility must provide all equipment.